We have Just Sold out of Star Wars A New Hope 16 Ounce Pint Glass. This Item is unavailable at present. From the Star Wars collection by Silver Buffalo. 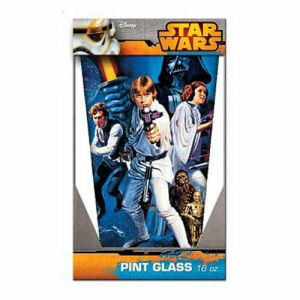 Star Wars A New Hope 16 Ounce Pint Glass. The pint glass measures 6 inches tall and holds 16 ounces. Hand wash only. Not dishwasher safe.